A multi-functional storm siren has been installed in the clock tower of the Saline County Courthouse in west central Missouri. Marshall fire chief Tony Day worked for more than a year to collect donations to buy a new siren. The cost of the siren was more than $20,000. It can also be used as a public-address system. Day says the latter unit can be deployed to other communities in the county to be used during festivals and other events. He began collecting donations for the siren after learning about a catastrophic storm in a Kansas community where people couldn’t hear the siren because of events happening, including a concert and football game. 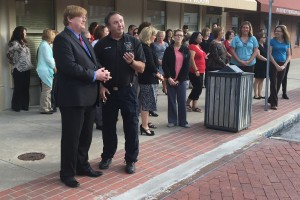 On Wednesday morning, several dozen area residents– including city and county elected officials and employees and several of the donors for the siren attended a ceremony to unveil the siren.